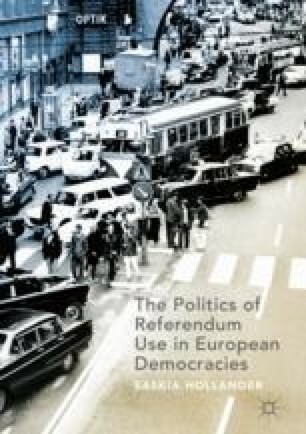 This chapter covers an analysis of referendum practice in France – a semi-presidential majoritarian democracy where ten referendums were held between 1950 and 2017. It provides an outline of available referendum provisions and the context in which these were institutionalized and used. It analyzes these practices on the basis of six independent variables: type of democracy, number of veto players, past referendum experience, public demands, political values and strategic interests. The chapter shows that French referendum practice is strongly embedded in the nature of its majoritarian polity, in which the president holds a rather dominant position vis-à-vis parliament. Consequently, referendums are primarily decision-promotive, held to affirm the position of the president and to mediate divisions over controversial issues within and between the two dominant political party-blocks. Moravcsik, A. 1998. De Gaulle and European Integration: Historical Revision and Social Science Theory, Center for European Studies Working Paper Series, Program for the Study of Germany and Europe. https://www.princeton.edu/~amoravcs/library/de_gaulle.pdf. Accessed 22 June 2015.